Brazilian time is 3 hours behind Greenwich Mean Time (GMT-3). Business hours for banks are generally from 10:00 to 16:00 on weekdays only. Banks are closed on Saturdays, Sundays and public holidays, however, their dedicated ATMs are widely available especially at shopping malls. Brazil’s currency is the real (R$,BRL). There are 2, 5, 10, 20, 50 and 100 real bills. Fractions of the real are called centavos and circulate in the form of coins. Coins come in 5, 10, 25 and 50 centavos as well as a 1 real coin. Since the 1 centavo coin was removed from circulation, if a bill with a fractioned value (e.g., R$ 24.52) is paid using cash, the change may be rounded up/down to the nearest value. If, on the other hand, you pay the same bill using the credit card, you will pay the exact amount. Currency exchange can be performed at designated establishments at airports or at shopping malls. Banks may also perform these transactions but only at specific agencies. Credit cards are widely accepted in major cities, especially in restaurants, shops and supermarkets. However, smaller towns, taxis or other small businesses may only take cash. Moreover, MasterCard and Visa flags are more widely accepted than American Express or Diners/Discover. In addition, certain currency exchange companies sell pre-paid local currency cards that can be used in Brazil. Either way, it is advisable to ask first if the establishment will accept your specific card. Tipping is not a traditional custom in Brazil. A 10% service charge may be added to your bill at restaurants and hotels. It is also not necessary to tip a taxi driver unless he assists you with luggage or provides an extra service. Belo Horizonte’s latitude places it in the tropical zone. Yearly temperatures average between 9 and 35 °C (48 and 95 °F). Even though inter-seasonal differences are not as pronounced as they are in temperate places, there is a contrast between spring and summer, and between fall and winter. The coldest month is generally July, with a lowest recorded temperature of 2 °C (36 °F). The 852-meter (2,795 ft) elevation of Belo Horizonte helps a little in cooling the city, suppressing high maximum air temperatures experienced in nearby cities at lower altitudes. Belo Horizonte’s climate is mild throughout the year. Usually the winter is dry and mostly sunny while the summer is mostly rainy. The electricity supply commonly used in Brazil is the 127-volt 60Hz system. However, most airports and some cities use 220-volt wiring. As such, one is advised to check your electronic equipment and the available power outlet beforehand. 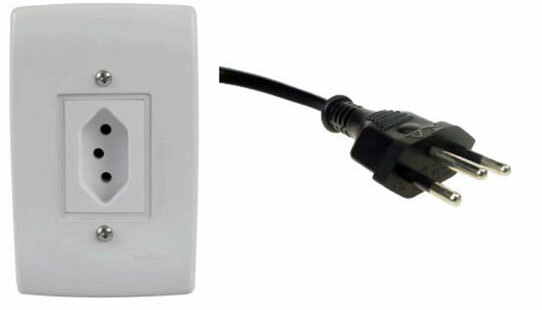 Moreover, Brazil uses power plugs and outlets of Type N, which consists of three round pins; two parallel (live) and a third one (ground) in the middle and slightly above the centerline. However, since this standardization happened quite recently (2010), it is possible to be faced with different outlets in older establishments. These may include Types A&B and Type C.
Although the official language of the congress is English, Brazil’s official language is Portuguese (more specifically, the Brazilian Portuguese). While the staff at airports and hotels as well as academic and industry members mostly speak English, the average citizen (this includes shop clerks and taxi drivers) may not. Therefore, it is advisable to have a few “magic words” at hand. Do you accept credit card? Você aceita cartão de crédito? church Onde é o __________? Being a Latin-derived language, Spanish, French and Italian speakers may find it easier to understand and pronounce most of the vocabulary. In any event, having a translation or pronunciation tool at hand may prove to be helpful. The Brazilian mobile network has some peculiarities when compared to the rest of the world, leading to some devices not functioning. Restrictions and regulations in this area are defined by Anatel, an acronym for National Telecommunications Agency. There is not a specific brand whose devices don’t work in Brazil, but devices that are not aligned to some Anatel specifications may be useless when arriving in the country. The best way to prevent any headaches is to check if the mobile phone being brought to Brazil works in various frequencies — in other words, if it is quadriband. Also, cellphones that are not homologated by Anatel may suffer interferences and other malfunctions. In these cases, the agency states that any eventual service flaws presented by non-homologated devices are the responsibility of the consumers. Try buying a Brazilian SIM card. If your cellphone is unlocked, getting a local “chip”, as known in the country, might be cheaper and more practical. dialed from landlines and cell phones. situations. To use it, just call 192 and explain the type of emergency to the dispatcher. natural causes such as flooding and burning. Brazil has some of the strictest smoking laws in the Americas. As a general rule, smoking in Brazil is forbidden in all enclosed public spaces except for specifically designated smoking areas. As such, smoking is not allowed inside the conference venue. The conference cannot accept liability for personal injuries sustained, for loss of, or damage to property of conference delegates (or any accompanying persons), either during or as a result of the conference. You are advised to travel with a valid travel insurance.